Happy Halloween!! After a night of trick or treating, and trying your best to avoid the barrage of candy, come home and treat yourself to the amazingly delicious, and low calorie, Roasted Pumpkin and Apple Soup Recipe. 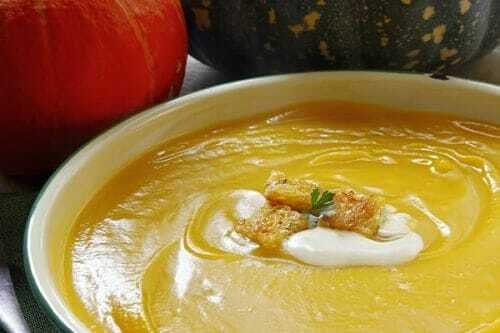 Creamy and thick, and seasoned with amazing Fall spices, this pumpkin soup is not only tasty, it’s super healthy too. With lots of fiber, and a good dose of protein, each 1 cup serving has just 3 Points. Pair it with a fabulous fall salad, and you’ve got yourself one awesome Halloween Night dinner that tastes incredible and is Weight Watchers friendly. Granted, this recipe does take some work, but the roasted flavor of the apples and pumpkin in what gives this dish it’s unique taste. Most other versions call for using canned pumpkin, which can certainly be done, but I so love the flavor of the fresh, cooked pumpkin. Enjoy!! And stay away from that candy bowl!! Indulge in this creamy and decadent Roasted Pumpkin and Apple Soup Recipe with absolutely zero guilt. Each serving has just 3 Points and has amazing Fall flavors that will make you forget it’s low calorie. In a large bowl, toss pumpkin, apples, onions, olive oil, 1 teaspoon salt, and pepper. Spread evenly onto a large rimmed baking sheet. Roast, mixing once, for 30 minutes. Add in sage, mix again, and continue roasting until very tender and starting to brown, 15 to 20 minutes more. Transfer about one-third of the pumpkin and apples to a blender along with 2 cups broth. Puree until smooth. Transfer to a Dutch oven and repeat for two more batches. Add in yogurt, ginger, nutmeg and remaining salt and heat through over medium-low heat, stirring constantly for about 5-7 minutes. Tip: Make it easier to cut a pumpkin, acorn squash or other winter squash: pierce in several places with a fork; microwave on High for 45 to 60 seconds. Use a large sharp knife to cut in half. I have a glut of red eating apples from my garden, they are a red skinned apple, not tarty or sharp like a Granny Smith. Can I use these instead in this recipe. Yes, that’s fine! As long as you provide proper credit and a link back to LaaLoosh :). If roasting the pumpkin in an oven, at what temperature should the oven need to be set? Bake at 350° for 45-60 minutes or until tender, using a fork to check. So if you use canned pumpkin, how much should be used? Arlene, its hard to know what the exact equivalent is because Ive never weighed the pumpkin after it has been cooked. I would guess it would be close to 2 16oz cans of pure pumpkin. It may be something you’ll have to experiment a bit with…. This was so so good! I would definitely make this again! When using canned pumpkin, what would be the equivalent amount? Can I use canned pumpkin? If so, how would it adjust the points value? Thanks! Liz, You can use canned pumpkin, just make sure it’s pure pumpkin, and not a pumpkin pie mix. It will not affect the Points value.